At Suzanne Morel Face and Body Care, we are always watching the latest trends to see what new looks to perfect for our Cabo brides and bridal parties. One makeup look we’ve been seeing a lot of on the red carpet is the matte lipstick and smoky eyes. When done correctly, matte lips are stunning and timeless. For example, a red matte lip is the perfect accessory if you’re doing a vintage or old Hollywood theme for your destination wedding. A deep purple or berry matte lip also makes a great hue for multi-cultural brides with bright, traditional clothing and jewelry. For brides who don’t wear lipstick often, or who simply prefer neutral colors, do not worry! Not all matte lips are dramatic and we can soften a look to suit your Cabo bridal look. Light mocha, peach and pale pink work well on many different skin tones, and we think you’ll love how these colors look in a matte finish. Just like matte lips, the smoky eye is a great make-up trend that looks fabulous as a wedding-day style. And the experts at Suzanne Morel Face and Body Care know exactly how to make this look work for you as a bride in Los Cabos! Again, the level of intensity we create for your bridal smoky eye depends on how much make-up you’re comfortable wearing, whether you will be indoors or outdoors, and of course your hairstyle and wedding gown. If you don’t normally wear a lot of bold make-up colors, then we can create a more neutral smoky eye with soft browns and golds. 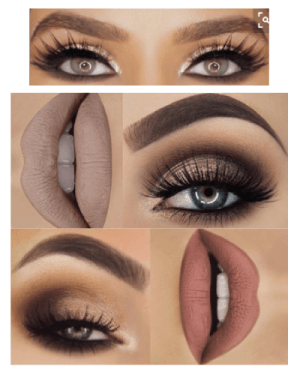 But if you want to really glam it up and you’re comfortable with that striking smoky eye look of the runway or the red carpet, then we can create a more daring bridal smoky eye with darker charcoals and deep purples. The way you wear these matte lip and smoky eye trends is all up to you, but remember we tailor your wedding make-up so that you will feel beautiful in your own skin as a bride! If there’s something you love about these looks, be sure to tell us before your make-up trial so we can show you how it will look on you before your big day. To schedule a hair and make-up trial, please call our salon at (619) 819-9180 and one of our English-speaking concierges will be happy to assist you! This entry was posted in Blog, Cabo Bridal Hair and Makeup and tagged amazing bridal hair and makeup, bridal look, Cabo beach style, cabo professional makeup, cabo Style, makeup, makeup ideas, makeup los cabos, matte lips, natural bridal look, smokey eyes, Suzanne Morel Cabo, suzanne morel ideas.